Here's The Scoop on the Stack! 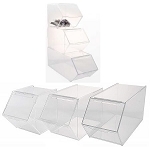 These Stackable Pivot Bins are great to show and display your delicious edible merchandise. An easy-open hinged lid makes scooping self serve products simple for your patrons and easy refills for you, with this acrylic scoop bin. Stacking containers are ideal for organizing and making more products easily accessible especially in smaller spaces. Use this container as a candy container or other food bin to lift sales and profits. 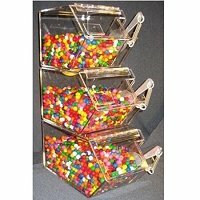 Stacking bins make wonderful candy or toppings displays, hurry and get yours today at All Candy Containers.